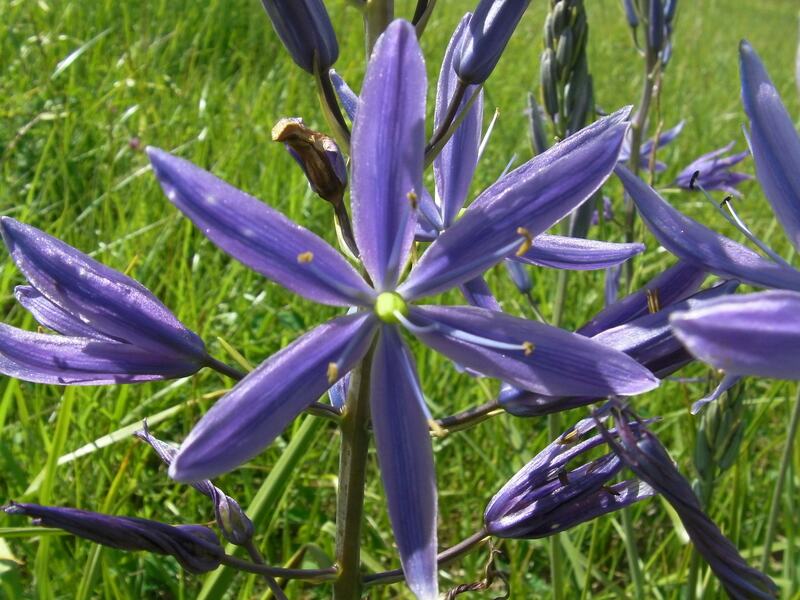 May 10, 2014…as I was driving to Eugene, Oregon, we spotted fields of this beautiful plant. I asked about it and was referred to Heiko Koester, a garden consultant who specializes in edible, medicinal, and native plants. 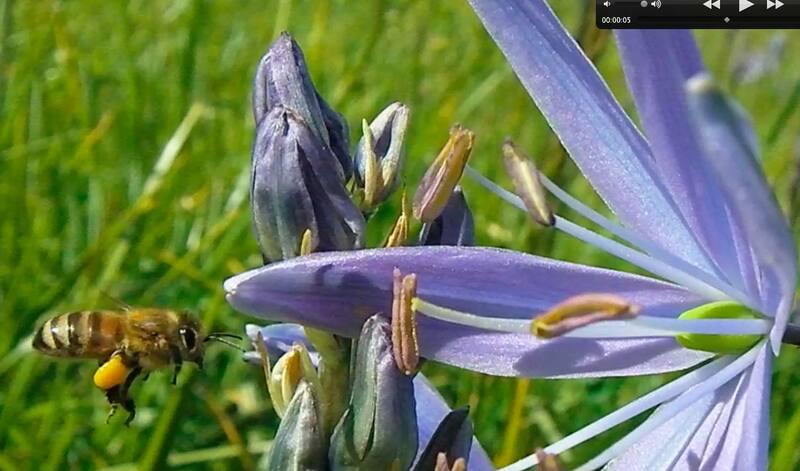 May 10, 2014…a honeybee can be seen looking for the perfect pollen source. In the video you can see the bee using her mandibles to pull the pollen off. 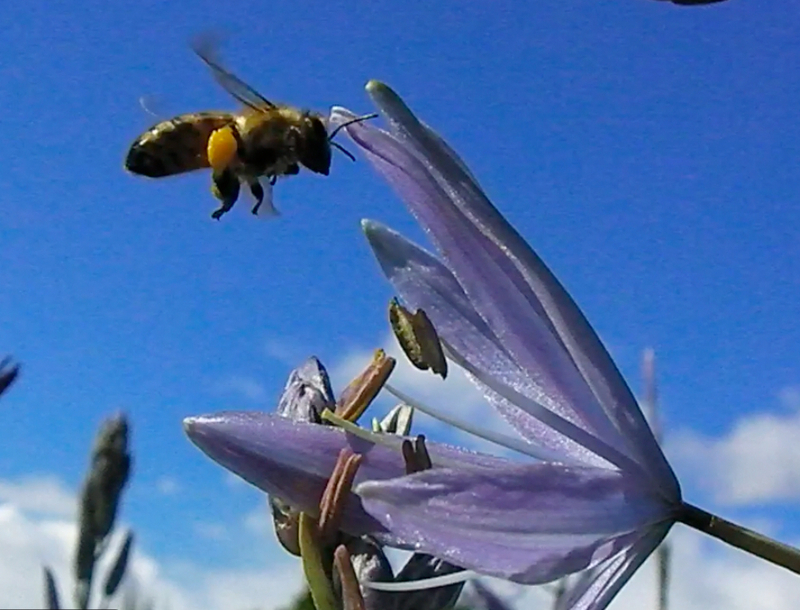 May 10, 2014…bee in flight over Camas. The flower-bee relationship can be seen when the flower opens a petal so the bee can get to the pollen. I missed it the first few times, so I marked it in the video. Great video, Pat. Remind me what camera you use? Those photos were taken by a little pocket camera that I bought on close out at a discount store (not Wal-mart) It’s a Sanyo Xacti 12 mp. The thing I like best is the “Super Macro” option. I can focus up to 1/2″ away. The bee image fills the frame. What I don’t like about it is that I have to focus by pressing the shutter 1/2 way down. Then I can take video that’s sharp. If I try just taking video, I don’t get good focus. It might be something I’m doing wrong because I really think it should focus in the macro mode when I’m taking video. But I am in the market for a good close up camera that takes sharp videos of fast moving things like bees. (I should say an easy to use camera…I don’t really want heavy lenses to work with.) Any suggestions? Well pressing the shutter release 1/2 way is pretty typical on cameras for focusing. I don’t really know a lot about shooting video, but I imagine you’d need some sort of continuous focusing mode. I don’t know if that feature is available on a point and shoot. My set up, while relatively cheap for macro, offers no autofocus which doesn’t really work for things like busy bees. lovely flowers & great video! thanks for sharing that! What an amazing looking flower; I’ve never seen these before. I love your posts identifying plants and trees, they make for great learning. Thanks, df. I’m learning too. I’m learning to ask questions. If I can find people who know about something, most of the time they are very willing to share that knowledge. Love that second photo, preparing to land 🙂 Great stuff as ever Pat. Thanks, Amelia. The Camassia I had never seen before. I’m not sure if it grows on the coast, but I’d like to try it out. It’s just such a pretty flower and if the bees like it, so do I.